Basically a mini Sims 3 World Adventures for Sims 4, Outdoor Retreat allows your sims to go on vacation. Outdoor Retreat adds collectible fish, plants and insects, the Herbalism skill and the Outdoor Enthusiast aspiration. You can now catch insects again (though only on the vacation world). Insects are used in some Herbalism recipes. ♥ Outdoor Retreat Fish – See Fishing. ♥ Outdoor Retreat Plants – See Gardening. To travel to the Forest from your lodging, press M.
The Deep Woods can only be reached through the rabbit hole in the Forest. Like other potions, Herbalism potions can be stored in the fridge. Insects can be stored in chests. If your sim starts and stops the interaction to Brew Herbal Remedy, put the stove/grill into household inventory. If on a public lot, reset the object with testingcheats. To mass produce Herbalism potions, put two grills side by side and start the second interaction while your sim is working on the first. Natural Herbicide Oil can only be used on plants when they require weeding. It removes the weeds (can’t tell if it does anything else, but one would think so). The Hermit has a recipe she will teach you if you are Good Friends with her. ♥ Stoves and Grills Master (1,500) – Cook Impeccable food and Herbalism potions (Also great for Cooking). Insects make great pillars. To stack/enlarge them, see Cheats. Finding insects can be frustrating at first but you will quickly get used to it. 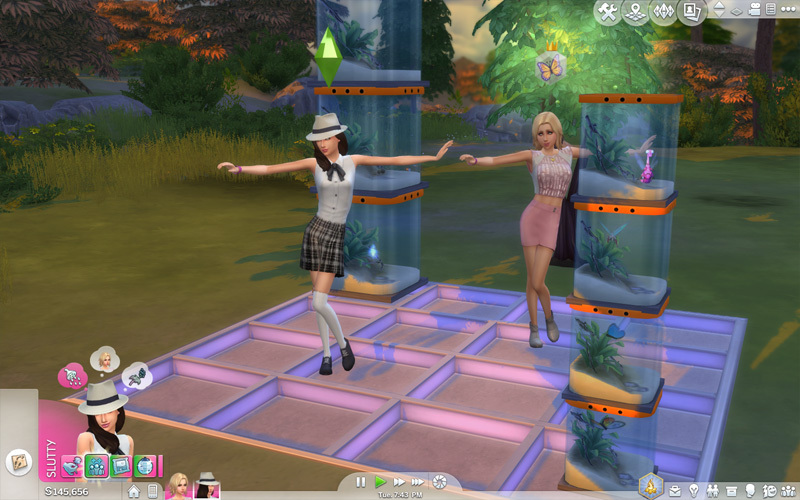 Insects will not appear while the game is paused (like Sims 3). In the Forest, F2 to edit the lot and remove all the big trees. Insects do not spawn in the editable area, so you can easily see where the area ends. Each time you find a spawn, save the camera (ctrl-5-9, 5-9 to return). Also, buy a bunch of portable lights (Lightbringer) and drop one. Lamps and everything else you drop returns to Household inventory when your vacation ends. Check your spawns when the sunlight shifts. Some may spawn more than once, but they usually don’t.